Low cost, pollution abatement system using an inflatable bladder requiring external air (latched alarm maintains inflated state). Low cost, pollution abatement system using an inflatable bladder requiring external air (automatic deflation once alarm recovers). Low cost, pollution abatement system using an inflatable bladder with integral compressor (latched alarm maintains inflated state). Low cost, pollution abatement system using an inflatable bladder with integral compressor (automatic deflation once alarm recovers). The Terminator utilizes a special bladder manufactured by envirovalve which is pre-installed within a discharge pipe. The Terminator system automatically regulates the inflation of the bladder which is sized according to the diameter of the site drain. It is activated if there is a risk of pollution leaving the site. The pressure is maintained at the required inflation pressure until the alarm condition is cancelled. Should the bladder fail to inflate properly then an alarm is raised, displayed locally and output to telemetry. The Terminator control system may be initiated by instrumentation measuring water quality, via a BMS telemetry system allowing remote control, by a fire alarm or manually by an operator interfacing with the local control. Depending upon the type of control required and the size of the bladder, various configurations are available. For small diameter bladders to 150mm dia. and where compressed air is not available, the Terminator may be supplied with an integral compressor. Alternatively external air may be connected which is also advantageous where inflation times need to be minimized. The system is often installed with instrumentation measuring water quality allowing automatic protection against release of contamination from site. 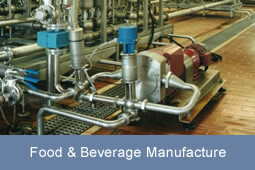 Typical surface water monitors include TOC, Oil and pH. Indicator parameters such as Turbidity, Conductivity and DO may also be useful. 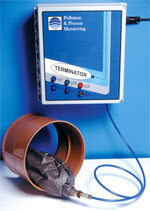 Terminator is a simple, compact and innovative solution designed to automate the isolation of site discharges. The system comprises a surface mounted controller connected to an inflatable bladder which is permanently installed within a discharge pipe. It is simple to install, simple to operate and is an effective control measure providing protection against release of pollution.